There are many stunning squares in Italy, but today I want to introduce you to the fairest of them all. Piazza dei Signori in Vicenza may not be as well-known as Piazza della Signoria in Florence, it is not half as expansive as Prato della Valle in Padua and, certainly, it is not splashed by water as San Mark’s Square in Venice. Yet, it has a soul and a beauty which you can enjoy unperturbed by crowds of tourists while savouring the authentic Italian life. Nestled in the heart of Vicenza’s historical centre, Piazza dei Signori is lined up with majestic buildings which have been idealised by architects and artists for the past five centuries. One is crowned by St. Mark’s winged lion and the other by a statue of Christ the Redeemer. Then on your right-hand side you will have the majestic Basilica Palladiana and on your left-hand side will be the equally stunning Loggia del Capitaniato. influenced even the appearance of the White House. 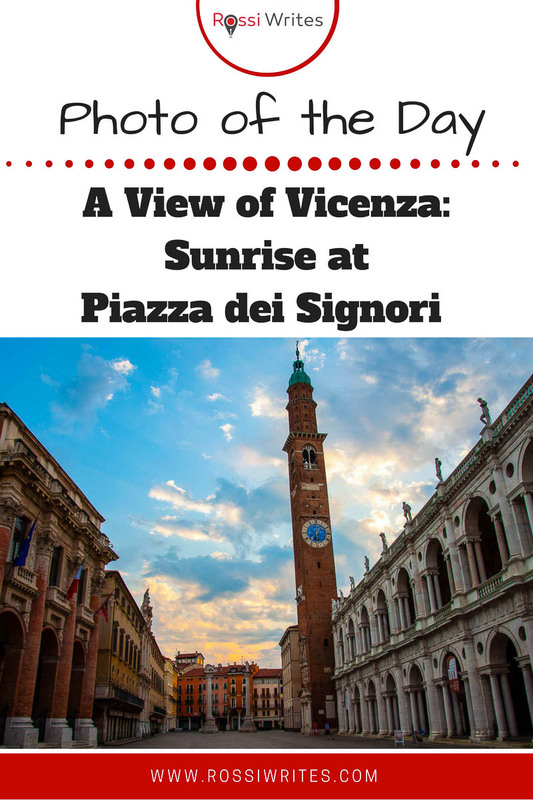 Yet, it is here in Vicenza – a smallish city in the Northern Italian region of Veneto – that you can admire and ponder the development of Palladio’s style in earnest while sitting alfresco and sipping a proper Italian coffee. For the Basilica Palladiana was one of the architect’s first big commissions and the opposite Loggia del Capitaniato was one of his last. from monthly antique markets to an annual chocolate fair. The best moments to be at the square though are in-between: in the mornings right after everyone has gone to work and Piazza dei Signori feels all yours; and in the early evenings when children run carefree and cyclists weave their way between the people who have come out for a passeggiata – the traditional evening walk to see and to be seen. I have spent many precious moments at Piazza dei Signori in Vicenza: having coffee, meeting friends, just crossing it from one end to the other on my way to somewhere else. is not an easy task. Especially when you are not a professional photographer and yet you want to be able to capture this much beauty and take it home with you. I have found that bending to an uncomfortable squat at the western end of Piazza dei Signori gives me the best shot. This way you have Palladio’s buildings at the forefront, the two pillars are clearly visible at the back, the colourful houses offset it all and the incredibly tall tower – Torre Bissara – makes you lift your gaze up towards the Italian sky. at that early hour. One was me. The other three seemed to be filming an independent film. The director-slash-camerawoman was positioned at the western end. The actress was skipping between the pillars at the other end and the third lady – moving around on her bike – served as a point of communication between the other two. Not wanting to interrupt their filming in any way, I moved as far behind the director-slash-camerawoman as I could and I took this shot. It is one of my very favourite from Vicenza in particular and life in general so far. What’s the most beautiful square in the world according to you?